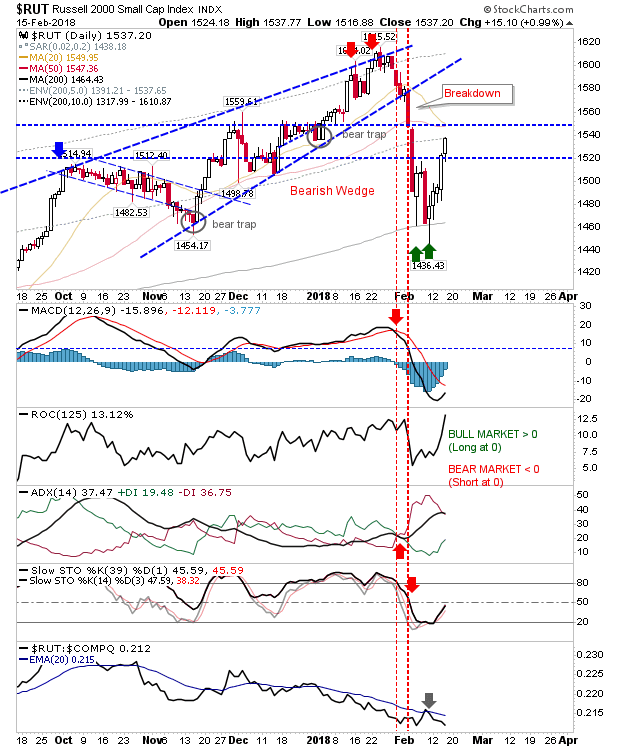 The bounces playing out for markets still have the look of relief bounces - at least until technicals confirm net bullishness. However, long opportunities present themselves. For the S&P, price action looks to be confirming a double bottom which should be enough to see a challenge of 2,873. Today's volume was lighter which suggests the rally from here will be a struggle but 'climbing the wall of worry' will suit bulls at this point. The Nasdaq played out a similar move to the S&P as interim Stochastics [39,1] crossed above the bullish mid-line. 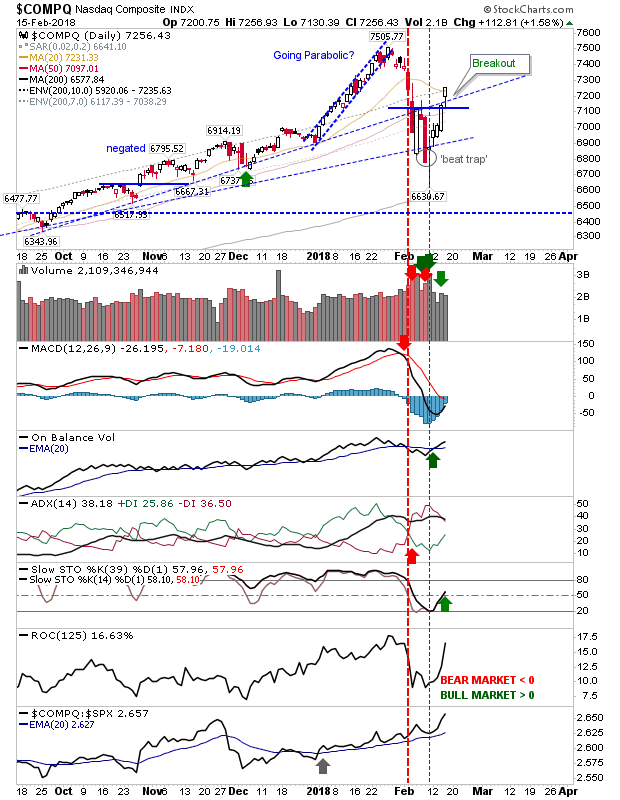 The index has made back over half its lost ground from 7,506 it's just a question as to whether it can make back the rest of it. The strongest aspect is the accelerating relative performance which marks the favoured rotation of money into the index. Finally, the Russell 2000 has moved higher in line with other indices. 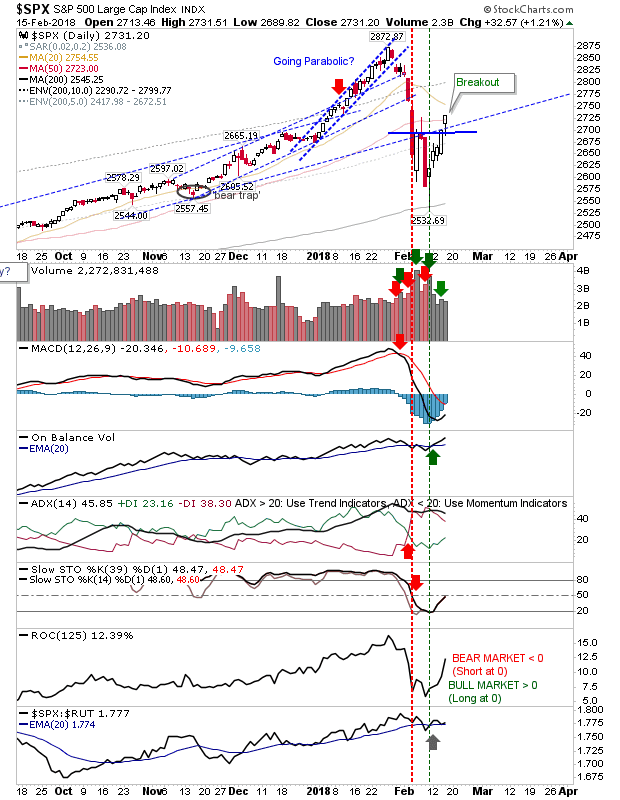 The index had the smallest relative gain on the day and has struggled most over the last 6 months but the successful defense of the 200-day MA will be a hard beat. As a footnote, the Russell 2000 still underperforms against its peers but should this change it will mark a cyclical shift back in favour of speculative stocks. Going forward it will be important for current rallies to continue and bottom-breakouts don't reverse into mini-'bull traps'. Any close above breakout levels tomorrow should be viewed as a success and a buying opportunity.